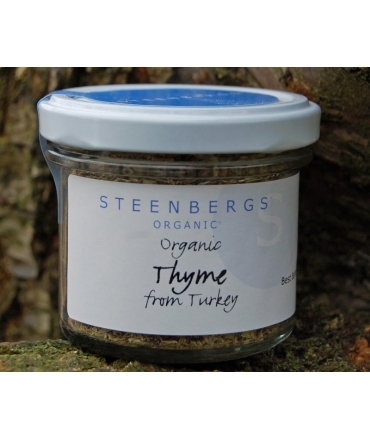 Steenbergs Organic Thyme is a fundamental part of any kitchen storecupboard. Organic thyme is truly one of the best cooking herbs in the world. With its vibrant flavour, organic thyme has a special affinity for poultry and pork. Use Steenbergs organic thyme for chicken where its an absolute must - rub on chicken or fish for the grill with organic garlic and organic pepper. Add organic thyme to split pea soup with ham, or mix with organic rosemary, organic garlic and organic pepper for a great roast or fish fry. 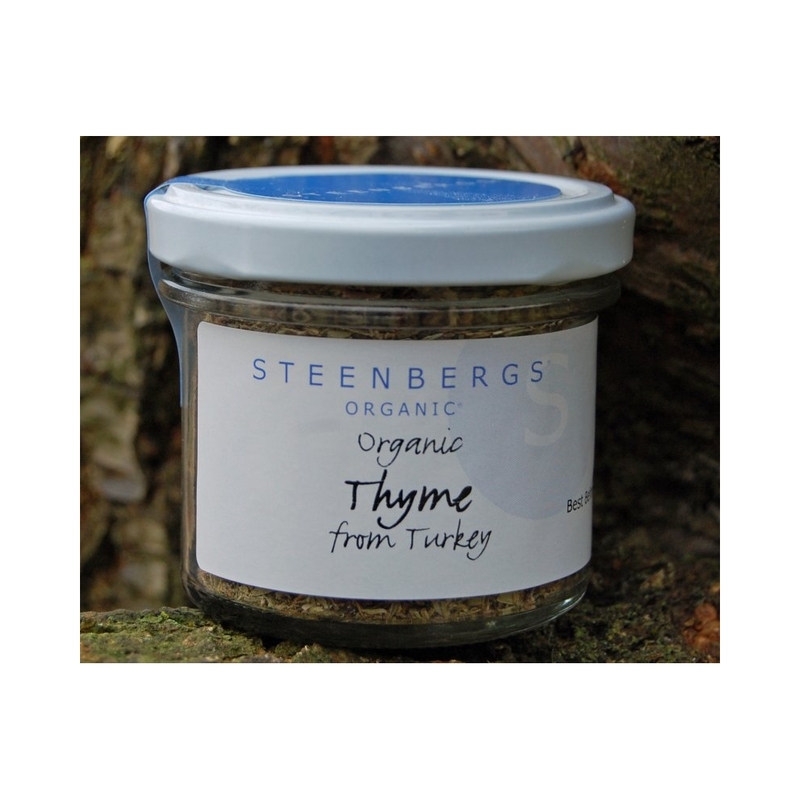 Steenbergs' thyme is pungent and spicy and full of medicinal, mouth-freshening sharpness that is really pleasing - in fact it forms the base flavour for almost all European cooking herb mixes - simply essential and simply delicious! There are many different types of thyme, although most garden (and cooking) thyme is Thymus vulgaris. This thyme is a small perennial shrub that is stiff and bushy in appearance with thin erect stalks growing to about 30cm (12 inches) in height and covered in pairs of small, elliptical gray-green leaves, which are 5-10mm in length (up to 0.33 inches). Thyme herb has pinkish-white, lipped flowers that are loved by bees and other garden insects. Thyme is almost dehydrated when ready to be picked, concentrating the flavours in its small leaves. Like other herbs, thyme is dried in warm shade, then its leaves are rubbed off. Thyme has a classic aroma that is pungent, warming and agreeable with hints of spiciness - maybe cloves. Thyme's taste is also pungent and warming with a mouth-freshening sharpness coming from its primary volatile oil, thymol.